The Changing Face of Economics gives the reader a sense of the modern economics profession and how it is changing. The volume does so with a set of nine interviews with cutting edge economists, followed by interviews with two Nobel Prize winners, Paul Samuelson and Kenneth Arrow, reflecting on the changes that are occurring. What results is a clear picture of today's economics—and it is no longer standard neoclassical economics. The interviews and commentary together demonstrate that economics is currently undergoing a fundamental shift in method and is moving away from traditional neoclassical economics into a dynamic set of new methods and approaches. These new approaches include work in behavioral economics, experimental economics, evolutionary game theory and ecological approaches, complexity and nonlinear dynamics, methodological analysis, and agent-based modeling. David E. Colander is Professor of Economics, Middlebury College. J. Barkley Rosser, Jr., is Professor of Economics and Kirby L. Kramer Jr. Professor of Business Administration, James Madison University. Richard P. F. Holt is Professor of Churchill Honors and Economics, Southern Oregon University. "A unique series of interviews with recognized economists attempting to rechannel the mainstream of economic thinking...An invaluable accompaniment to any history of economic thought." 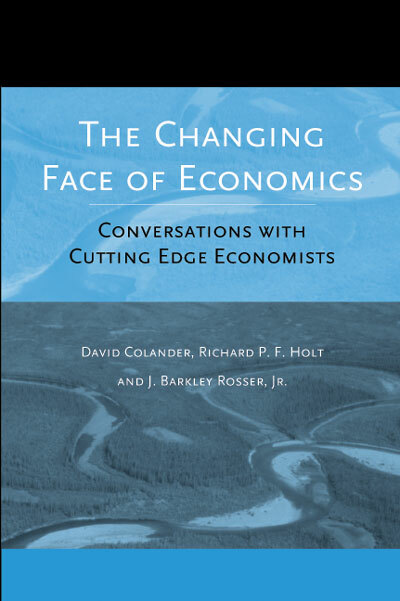 "These interviews offer insight into how mainstream economics has been influenced by those working at the edge—a must-read for understanding the evolution of recent economics." "Contends that the old economic orthodoxy based on rationality, greed, and equilibrium is in the process of being replaced by a new orthodoxy based on purposeful behavior, enlightened self-interest, and sustainability, and exposes this change through interviews with twelve economists who have been, or are currently, involved in this change."